Discussion in 'Gear & Apparel' started by Bob, Sep 9, 2018. Before I pull the trigger on new boots I thought I'd ask here for recommendations on a light Trials or Adventure Touring boot that's comfy and re-soleable. Thanks in advance for suggestions on works for you. Dunno, one of the guys at the rally really likes his Sidi Adventure boots, the 3 buckle not the 4 buckle. I’m thinking about getting a set of Adventure boots too so I’m not touring as much in my MX boots. I've found my Gaerne Balances to be enough boot for me but after eight years I'm trying to ease them into retirement. Tried on the Sidi Adventures last week on the recommendation of an Inmate here but the toe box was too tight even in a full size up. Also tried the BMW Gravel boot but found the heel cup way too roomy even with them cranked down to maximum tightness. I'll post pics and a brief review of whatever I end up with. $20 Canadian Military leather boots. Bought new at the Army-Navy store. I water proof them once a year and they have kept my feet dry for several years. Suitable for the street and light adventure. Not a lot of protection if you plan on pinning them between trees/rocks/earth and the bike. I am using TCX Infinity Gortex. Gortex is the way to go. Sorry for the hugh photo. 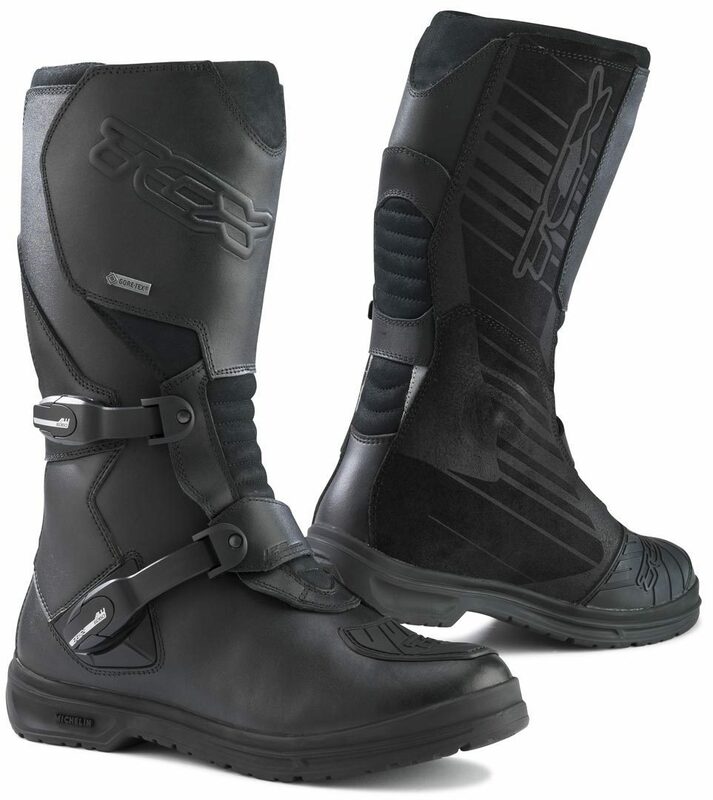 Seems like every manufacturer has ADV boots now, it just depends what you can find in your area or online. I am delighted with my Forma Adventure boots. Yep, did the same thing, even had them resoled with Vibrams when the original soles went. Pros: leather lined and resolvable; keep debris out. Cons: laces didn't go down the toe box far enough for foot control in some terrain; plus minimal off road protection. Haven't ruled out something similar. Great pic Backdraft. Tried a pair on at the same place I tried on the A-Stars. Both brands fit ok and that style is on my short list for sure. The gore-tex would be a plus for sure if the gaiter comes to the top. One of my riding buddy out here has the Formas. Very neat boot, don't hook up in anything. Haven't seen any locally yet. they are a bit spendy, my only advice is to ensure what ever boot is purchased, it has to be GORTEX, IMHO. Gortex offer a wicked lifetime warranty, and because of that I switched from the BMW Rallye to KLIM . BTW, a buddy of mine is riding home to Calgary from The Rock. He texted me last night saying he was in Duluth and going to check out Aerostitch. Says they measure you for a proper fit. He has top of the line Klim gear now but starting to look for Summer weight stuff for next Season. He found the Klim too black, too hot and too heavy in Baja earlier this Spring. Says some of the 'Stitch stuff is pretty light if anyone did not know that besides me. Bob, I agree with your buddy on the KLIM stuff in hot temps. Riding through Montreal and Quebec city this past Canada day at 39 degree temps was a tad uncomfortably with all the gear on.. Wished I had a mesh jacket for those few days. I picked up a mesh jacket for the return trip from Ottawa this year. The Aerostich jacket works well for rain but does little to help in cold or hot conditions. We used to wear bread bags inside our wet boots as kids! My Sidi Disco rains have always kept me dry. I have Gore Tex boots for the C14 but haven't really put them to a good test. Always a challenge cleaning and treating Gore Tex for sure, especially if bog is involved. I tried these on yesterday to get the Gaerne sizing right. They're listed as a beginner MX boot and surprisingly comfy plus I thought a good price at $338.00 Too bad they're not what I'm after. Once we had the right fit sorted I went with the sales person to the counter to order a pair of Balance Oiled size 44. Unfortunately their supplier Thibault Ltee. in Quebec didn't have any in stock, just said N/A. So the local dealer can't get them. Too bad as I try to buy locally if I can. Strange because Fort Nine has them and Twisted Throttle says "Special order item, additional lead time may be required". Anyone know of any other on line Canadian vendors that sell Gaerne? I'm steering away from the Gaerne All Terrain Goretex model and going with the Balanced Oiled, not because of the Gore Tex, but because the Balance Oiled has better leather ... better cut, thicker, oiled, and breathes better. The Balance Oiled has Gaerne's proprietary 'waterproof' liner but that will probably chafe through eventually and let them 'breathe' better. I'm thinking the Balance Oiled's are scarce due to this being late in the Season. If I can' get a pair over the Winter I'll start working on a 'Plan B' which will include a serious look at the Aerostitch Combat Lights. I have a pair of the Combat boots. I like them but certainly not as much protection as new styles or MX. I smashed my big toe pretty good in a get off a couple of months ago.